Solitary pulmonary nodules are usually identified on routine chest radiographs in asymptomatic patients. Most nodules have a begin cause but broncogenic carcinoma, metastases and other malignant process are important causes as well and must be excluded in differential diagnosis. 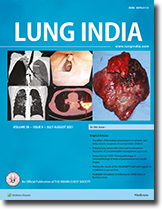 The present study includes 51 patients having solitary pulmonary lesion in x-ray chest. Of the 51 patients, malignancy was confirmed in 52.94%. Pneumonia in 21.56%, tuberculosis in 15.68%, Hydatid cyst in 7.84% and A.V. malformation in 1.96%. Traumatic Pulmonary Pseudocyst is an uncommon pulmonary lesion which results from blunt trauma to the chest. Described as a clinical entity which manifests itself with â€œminor clinical entity which manifests itself with â€œminor clinical signs and major radiological signsâ€� the pseudocyst most often has a spontaneous resolution. Various mechanisms have been proposed to explain the formation of the pseudocyst. We propose another hypothesis to explain the formation of the pseudocyst: ie the development of a â€œbroncho-pulmonary fistulaâ€�.